Esperanza Spalding | Emily's D+Evolution - TheUrbanMusicScene.com | Music Reviews! In mid-2015, Esperanza Spalding was about to prepare her fanbase for some musical vignettes incorporating aspects of theater, unveiling her inner childlike, yet intriguing thoughts about love, life, and everything in between for Emily’s D+Evolution. Her latest release expands her platform to learn and grow in her artistry quest. This journey, without question, would reveal another angle of this Grammy Award winning vocalist/musician/composer and teacher, who has already graced the modern jazz world with her astounding vocal range, Brazilian pop edges and chamber music influences. Though her mastery of the jazz bass and voice remain unchanged, Esperanza is clearly exploring unchartered waters, at least to most who are familiar with her previous body of work. From one extreme in Chamber Music Society in 2010 to another with Emily’s D+Evolution, Spalding is obviously willing to further risk, perhaps, in reaching a theatrical audience with her already diversified musical portfolio. Now one might be asking who is Emily? It is the middle name of the Portland, Oregon native that was always willing to put on a show as a child with her hair tied in braids and black rimmed glasses. Throughout Emily’s D+Evolution, Spalding invokes her childlike spirit in a fusion jazz/rock theater’esque soundtrack. Her ambitious musical vision is executed by a trio of Spalding’s fretless electric bass, guitars (Matthew Stevens) and drums (Karriem Riggins), whose spacing and dynamics are seamless in crafting the ultimate stage performance atmosphere, occasionally sprinkled with spoken word. While there are a couple of quirky moments during this D+Evolution, the best work here provide some possibilities that alternative rock or modern jazz radio could gravitate to. Now that the introduction to Emily has now been established, this D+Evolution is most effective on its engaging musicianship that embraces rock, pop, funk, folk and bebop, led by Esperanza’s commanding, multi-range vocals. Based on the pre-release touring so far, Spalding just might be onto another Grammy nominated opportunity. Four and a quarter out of five stars. 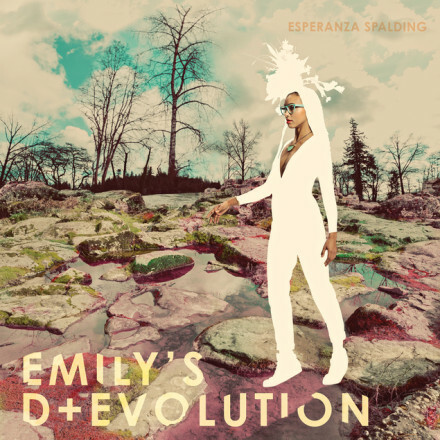 One Response to "Esperanza Spalding | Emily’s D+Evolution"
As always, Ms Oliver you’ve outdone yourself with this review. Thanks for your insightful reviews.